Then inspiration hit. How hard can it be to make gluten-free fruit cake for myself? I already make several types of gluten-free baked goods as it is, to very tasty results. Plus fruit cake doesn’t need to rise much in the first place. For it to mimic the real thing, it shouldn’t need much technical wizardry, coaxing or a kitchen full of exotic ingredients. And so the hunt for a gluten-free fruit cake recipe began. Of course, I didn’t want a recipe that required a whole day, nor did I want to slave over a stove for hours. I didn’t want to run all over town for ingredients nor did I want a list of fussy instructions that would have me scratching my head throughout the journey. I wasn’t asking for much, at least I didn’t think so. After ten years, I seem to have developed intuition about picking recipes that have potential for success and which ones I likely won’t bother with again. I knew I could find all of the ingredients at my nearby Bulk Barn store. It didn’t require 712 complex steps or 217 ingredients. Preparation time and baking time seemed about the same as any good quality dessert I am capable of making. This one seemed worth a try, substituting the regular flour for all-purpose gluten-free flour. My first batch turned out reasonably well, except that the fruit and nuts congregated to the bottom of the cake. Even though the recipe calls for only the nuts to be tossed in the flour mix, my partner suggested I do the same with the fruit. It worked like a charm as they are now suspended in mid-cake! It’s like a little miracle. Pine nuts can get expensive, so to keep my fruit cake recipe tests affordable, I used finely chopped walnuts instead, which worked fine. Ever since, I must have made the recipe at least a dozen times throughout the year, practicing to make it perfect. It just keeps getting better and better as I fine tune the recipe to my liking. I am able to make about 18 to 20 pieces out of a batch, and freeze some in plastic bags to eat later. That way, I’m not forcing myself to eat it while it’s still fresh and getting sick of it along the way. This recipe has returned one of life’s simple pleasures back to me, and has made me a year-round fan of the treat. I know exactly what goes into it and am achieving some really satisfying results. I’m sure my grandmothers would be very proud! 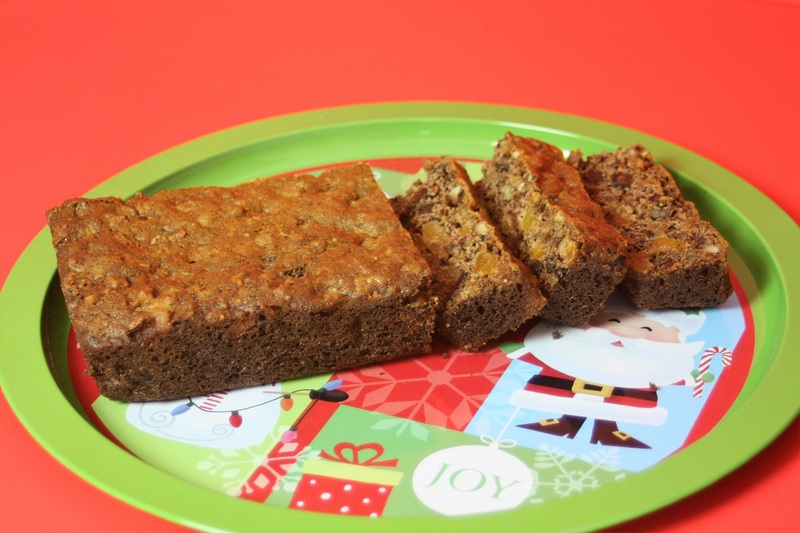 Great gluten-free fruitcake… it’s not just for Christmas anymore!